Congratulations my son Michael & Tikka! They took the Service dog test on 9/24/13 and passed with a score of 87.5! I am so proud of the dedication and hard work he put into training Tikka along with trainer Chad Alden of Sentinel Canine. For the past 10 months they have been training together. Thanks Chad! Tikka passed the Service Dog test on 9/24/13! 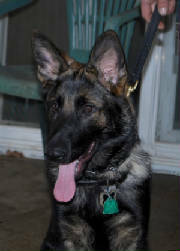 My son Michael is her handler and their trainer is Chad Alden of Sentinel Canine. Watch Tikka & Michael here. First, we adore our Theo. He is big and goofy, laid back and fun to be with. He loves to "read" his newspaper in his outdoor lounge chair. We noticed on your website that many people have written to you - bragging about what a good dog they have, etc. No one ever says anything bad - why would you - because your dog is the "number one in the world." So we decided to write you a letter telling what having Theo has "really" been like: While he is 6 months old he has accomplished a lot! And his favorite TV show is Jersey Shore! We've attached a picture of Theo in his favorite patio chair - of course, since the photo, he made a big hole in it so now it is really his and he still has a spot to read his newspaper. Now that's what I call unconditional love! LOL! Congratulations to Janine & Rex! 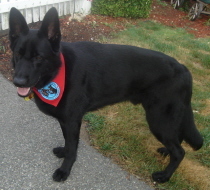 On March 27, 2010 Rex passed his Therapy Dog International test at Finlayson's Pet Center in Concord NH with flying colors! 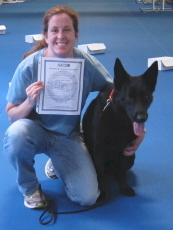 Congratulations to those who passed the CGC test on 6/13/10! Congratulations to Teresa & Kasch! 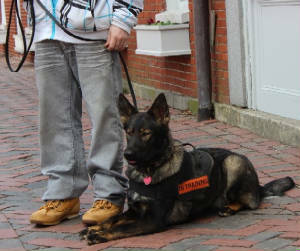 Teresa & Kasch passed the Therapy Dog test 4/10/10 at Performance Plus in Taunton, Ma. This enables Teresa to continue her therapy work. (Kasch was already certified in my name) Teresa tells me Kasch was the best dog there! Kasch uses her TDI at a group home through the Department of Developmental Services. She visits on a regular basis and is much loved by the residents and the staff. 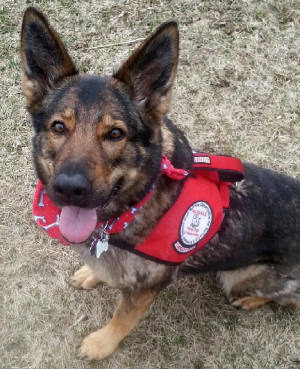 I am pleased to report Thelma passed her therapy dog certification test this past Saturday (April 5, 2014). Yesterday Thelma went on her first therapy dog visit at a senior adult community day care program. She visited most of the two hundred senior citizens at this facility. Thelma did great and was a big hit with the senior citizens, especially the ones with disabilities. Also the staff and director of the facility enjoyed Thelma as well and kept coming over to Thelma every chance they could during Thelma's rounds. She gave lots of kisses and it was heartwarming to see the smiles and hear the laughter of all people Thelma greeted. Thelma made a difference and brighten the day on this TD visit. On April 14th, Thelma is scheduled to visit second and third graders at the library of one of the Winchester elementary schools. Also, she will be visiting Tufts University to meet the students preparing for finals and give them a pleasant distraction and stress relief from finals. Last year Chester and Ava went on four TD visits at Tufts University and both were big hit with the students. Although Thelma is making wonderful progress when meeting dogs she doesn't know, at this time I only plan to take her on TD visits with other TD dog teams she knows well. Dog B.O.N.E.S. would like to have Thelma at the Boston Children's Museum visit in June. Thelma is not ready for the Boston Marathon or Special Olympic visits this year, as there will be far too many therapy dog teams and she is just not ready for that type of exposure. But next year Thelma may be ready to attend large TD events. Happy Mother's Day!!! How are you? I hope you are doing great! Alexis and I are great. On Friday Alexis and I were in NY competing in the second NW3 trial in New England. There were 21 teams and 7 team passed. Well, we were one of the 7 who titled. We received 2nd place in the interior search and 3rd place in the container search. And........we placed 2nd overall. Alexis was a super star! 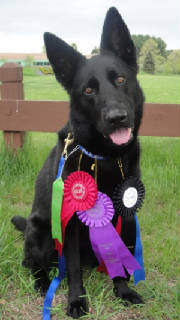 Attached is a photo of her with all of her ribbons. It has been awhile but Alexis is doing great. 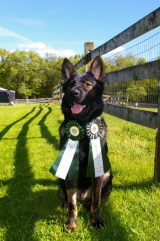 On May 14 Alexis and I titled in the very first K9 Nose Work trial in MA. The title is NW1. There were 38 teams entered and only 11 teams titled. Out of the 11 teams Alexis and I placed second. Alexis also received first place for the fastest time in the vehicle search. She found the find in 14 seconds. Alexis seems to really love this sport. Before each search she would pull me to get to the search. She is just awesome. 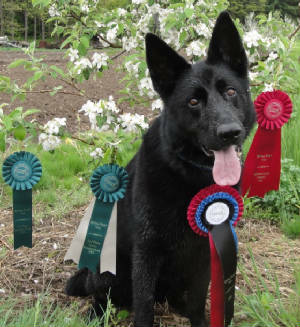 Attached is a photo of her with her ribbons. Here is a description of what the trial was all about. Proficient in one odor: (Birch); must have ORT on file with NACSW™. Only odor #1, Birch, will be included for this title. One hide per element at this level. Only birch may be used in each element. 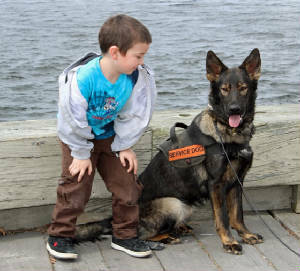 Alerts: Handler must call the alert, but a formal, final trained response by the dog is not required. It is valid if the handler calls alert even if the dog is not exhibiting one of the specific alert behaviors stated on the score sheet before the start of the first element. Height and accessibility of hides: Should be no more than approximately four (4) feet high. The source will be accessible to the dog (but may require the handler’s help to get close to the hide in some cases). Congratulations to Sandi & Alexis for passing the ORT 1 test!! On May 31, 2010 Alexis and I took our ORT 1 test. The exciting thing was that the founders of Focus Nose Work were here to Judge the test. There were 28 dogs taking the test. Alexis and I were number 5 to go. I was so nervous but Alexis knew what she was there for and was ready to go. We had three minutes to find the scent. I gave her the command "Alexis are you ready to work.... Find It".. and we were off. Alexis chose the left side of the boxes to start her search. We are going down the line of boxes at the 5th box she did a quick head turn and stayed on the box. I called Alert and the judges said we were correct. Alexis found the scent in 9.75 seconds. (Well she actually found it quicker but I wanted to make sure she was right) She was. I was soo proud of her. She is just too awesome. I have attached some pictures of Alexis and I with Amy and Jill (the co-founders) and then one with them and my instructor Gail. Below is the information on the test. I think I forgot to tell you that Alexis and I passed the ORTs for Anise and Clove on January 23, 2011. She did great. I was really nervous but I she was a pro. She just amazes me! She knows her job and she does what she is suppose to do. We did the Birch ORT in May of 2010 and we passed. I think I already told you about that one. Trial entry requires that handler/dog teams must have passed the appropriate Odor Recognition Test (ORT) in advance of the trial. The purpose of the ORT is to verify that the dogs know the target odor (scent) used in competition. Successful passage of an ORT requires a dog to identify the location of the target odor and the handler to correctly call an ‘alert’ (or equivalent) within a three-minute time period. The Odor Recognition Test must be judged by an NACSW sanctioned certifying official, who could be an approved K9 detection handler, a CNWI and/or other qualified person at the discretion of the board of NACSW. A Certified Nose Work Instructor (CNWI) may judge an ORT as long as it is not for current students. A listing of officials is available through NACSW. Congratulations to the following people who passed the STAR Puppy program on 5/29/10! Congratulations! to the following people & pups who passed the S.T.A.R. Puppy Program on 1/23/2010! 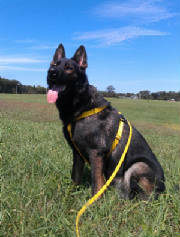 SOLD to Crusade K9 Academy! Congratulations to Max! 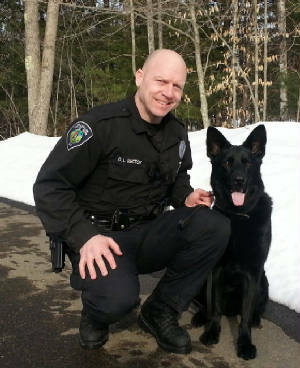 Max is now a working K9 with the Franklin NH PD. Thanks to the imprint training at Crusade K9 Academy! 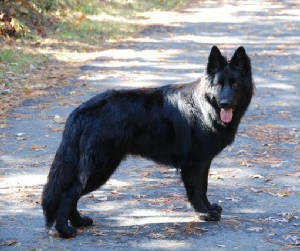 Max is a nice solid black male out of Frieda von den Wilden Teufeln & Joseph vom Konigsdorf. Max has good temperament & drive, a bit dominant. He needs some further training, possible protection prospect or family companion. He is crate trained, house broke, all up to date vaccinations. He will be 2 years in March 2014. Needs experienced person who will provide him with the proper training, exercise and attention. Hip prelim's OFA Good. Hello Cathy - How have you been. 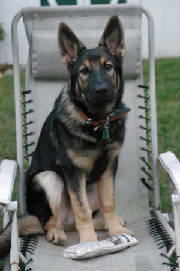 I am attaching pictures of Arko. He is growing up to be a handsome boy! Can I tell you that he is the BEST boy EVER! He is SO good with the kids and follows them everywhere! He is so sweet and cuddles up to you on the bed and gives kisses and gives you a bath..haha! He has the BEST personality and listens very very well. He loves to play ball or whatever you throw to him. He is so cute, when he comes out of the crate when we get home, he must have a toy to grab and run around with. ALWAYS has to have one in his mouth (similar to Mesa, as I remember?) And he loves to carry sticks that are bigger than him - he is so funny! We are SO HAPPY with him!!!! I am always checking out the new puppies - they are adorable!! Hope all is well with you. Rex won most regal dog in a photo contest! Click here to see article. 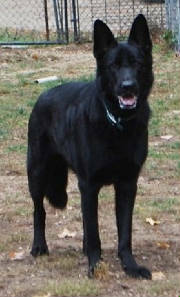 Just wanted to let you know that Salem earned his HIC today at a herding test in Lebanon, CT. He took 2 tests under 2 different judges and passed both! :) The judge told us there was no doubt he has the ability to herd and that he quickly understood what was expected of him. Today’s tests were actually on courses geared more for border collies, aussies, etc. She was impressed that Salem did so well on this style course as shepherds herd in a different manner and typically run German ‘border’ style courses. We had a great time learning about herding and watching Salem & the other dogs work the sheep. 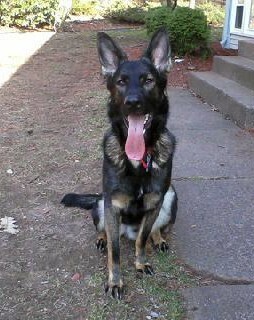 Thought you might get a kick out of some of the talk about pets, many of which are Shepherds. Several people have inquired about Layla and several, including myself have given you a plug. Hopefully it'll lead to a sale or two. All's well with Layla (aka Lulu) who continues to amaze us with her intelligence and sweet disposition. It might interest you to know that Jules has taken to Layla in a way she's never done before with any dogs we've had. And Layla seems to be a 'mommy's girl' to boot which makes me a little jealous although I love the fact that my wife has such an affection for this dog. Jules (sit down when you read this) even reads to Layla daily and has music lessions with her using a piano. This dog is unreal in that she loves to be read to and enjoys music. Best of all, her disposition is such that we don't even have to leash her. She never strays and seems to know exactly what we're saying about staying close or not going where she shouldn't. It's unbelievable how intuitive she is!!!! But I suspect you already knew that.